A.) 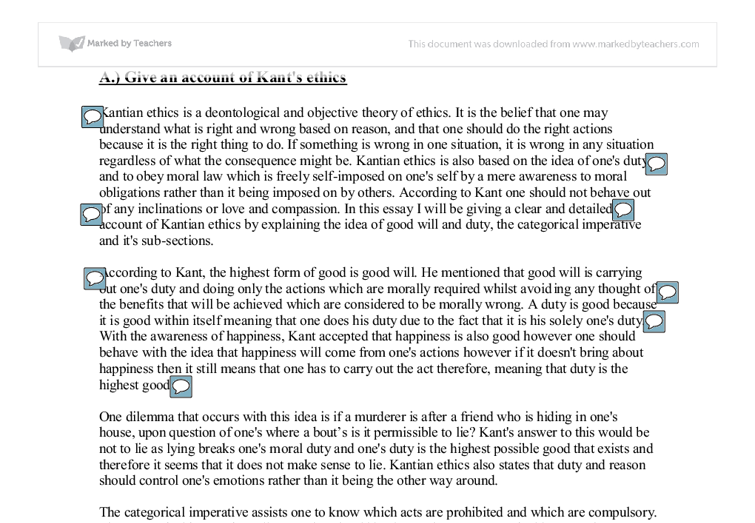 Give an account of Kant's ethics Kantian ethics is a deontological and objective theory of ethics. It is the belief that one may understand what is right and wrong based on reason, and that one should do the right actions because it is the right thing to do. If something is wrong in one situation, it is wrong in any situation regardless of what the consequence might be. Kantian ethics is also based on the idea of one's duty and to obey moral law which is freely self-imposed on one's self by a mere awareness to moral obligations rather than it being imposed on by others. According to Kant one should not behave out of any inclinations or love and compassion. ...read more. One dilemma that occurs with this idea is if a murderer is after a friend who is hiding in one's house, upon question of one's where a bout's is it permissible to lie? Kant's answer to this would be not to lie as lying breaks one's moral duty and one's duty is the highest possible good that exists and therefore it seems that it does not make sense to lie. Kantian ethics also states that duty and reason should control one's emotions rather than it being the other way around. The categorical imperative assists one to know which acts are prohibited and which are compulsory. The categorical imperative tells one what should be done. They are categorical because they are prescriptive and awareness is a reason for doing something and therefore moral statements are categorical as they prescribe behaviour and ignoring the outcome. ...read more. R.M Hare describes how to test a rule by understanding the consequences on affected individuals, then to imagine yourself in the position of others and finally to ask if the rule should be followed for everyone involved in the situation. The treatment towards humans that is considered to be acceptable is unique as humans are the highest forms of creation. Such treatment includes every individual developing intellectually, morally and physically. Humans must also seek happiness upon each other evenly rather than giving someone more happiness and joy whilst another becomes sad or takes away one's freedom. The third principle of the categorical imperative states that all humans must treat each other as ends meaning that humans must treat themselves for the sake of others and not to use others for your own intentional benefit therefore certain rules can not be created such as lying to others because they do to you because everyone would become unbearable within society. ...read more. 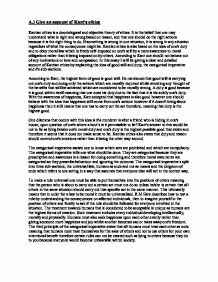 The essay presents most of the key points concerning the nature of Kant's moral philosophy. A lack of clarity means that many of these statements are very confused though and while they include the sort of words you'd expect to hear, the arbitrariness of the order makes it difficult to tell whether the student really know what they are saying. The discussion of the categorical imperative is particularly poor, as little understanding is shown of its three formulations. The one of the key benefits of rule utilitarianism is that it solves some of the problems involved when assessing act utilitarianism. Aquinas believed that we are naturally inclined toward the good, but we cannot aim for it directly as it is too abstract. Instead, we should aim for concrete goods that are evident immediately, such as life, procreation, knowledge, society and reasonable conduct. When he goes back to tell the others of his remarkable journey, they do not believe him, and think that he has become insane. The fact that he can no longer see the shadows reinforce their views of him, and when he tries to make them follow him, they put him to death. Plato gives many examples in understanding the Forms, examples of 'cats' and the mathematics way of 'circles'. He believes the form of a circle exists but not in the physical world of space and time. It exists as a changeless object in the world of forms or Ideas, which can be known only by reason. A stance to take could be describing what God is not e.g. 'God does not have a body'. This is the approach that Jewish theologian Maimonides took to speak about God. Maimonides's Theory, Via Negativa was influenced by the works of Aristotle, he believed in Aristotle's conclusion that God was outside of space and time. He believed that philosophy, ethics, politics, mathematics and physics were vital for understanding the natural world. He was hostile to the Arts because he believed these obscured the truth, and were only pretences. In fact, Plato was set on finding out the real truth, and how to gain pure knowledge. However convincing yourself that a wrong action is right is more evil than the action which results from it. John Henry Newman also took Conscience from a view point and took an intuitionists approach to conscience. This meant that the mind is able to percieve abstract concepts of truths normally thought to beyond empirical evidence. Paul Tillich was a theologian who believed that it is possible to speak meaningfully about religious language and came up with the theory that religious language, because it is symbolic in nature, has a profound effect upon humans. Tillich starts by making a distinction between signs and symbols.